أفضل مبيع. نعل مقسم سهل الارتداء. مصنوع من جلد ناعم ومتين. تصميم علوي منخفض المستوى. حشو من مادة النيوبرين القابلة للتمدد. رقعة وكعب من EVA يتميز مسند الكعب بميزة تخفيف الشُعب التي توفر خطًا أنعم. نعل داخلي مبطن بالفوم. بطانة قطنية ماصة. متوفرة أيضًا بمقاسات الأطفال. سيناسب شكل CP01. ابدئي مع أحذية الشارع بمقاس الرجال بمقاسين أكبر. My shoes arrived today and they fit like a glove! I just wanted to update y'all because reading through the reviews on Amazon was giving me a headache. Between people saying they were a perfect fit and that they run up to two sizes too small. My takeaway from sifting through the reviews and product information was that you should buy the size you usually wear, unless perhaps your big toe is longer than your second toe, in which case, order a half size bigger. They will start tight and stretch with wear. I ordered in my usual size and I'm happy with the length. They look tiny when you take them out of the box, but they are stretchy. My toes are a little snug in the front, but going by what other people (and the company) say, they do stretch more with time. My big toe is a little shorter than my second toe and I can see why it might be a problem if it weren't because the top of the shoe is quite round. I'm really glad I ordered the wide (for my wide feet), because they are pretty tight across the instep. So, anyway. These are so comfortable, and light, and give a nice balance between security/grip and slipperiness for spins. Looking forward to trying them out next week! I will update this review if they wind up not living up to my expectations on the stage floor. Great Jazz Shoes but sizing is TERRIBLE! I'm giving it 4 stars ONLY because the sizing is WAY OFF. 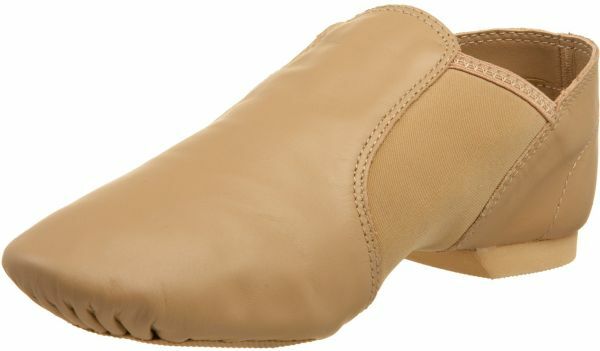 Capezio makes the best dance shoes with the highest quality and that's the only shoe that's allowed in my daughter's dance class. She wears a size 2 in regular shoes - sneakers, a 1.5 size in sandals. I ordered size 3, 3.5 and 4 to see which one would fit. The size 4 BARELY fits. So I'm returning all 3 sizes and ordered size 4.5. She wears a 2.5 in the Capezio U-shell tap shoes and a size 2.5 in the Capezio ballet shoes. Also for these E series Jazz shoes - there is no "child" sizes - it stops at 1.5 for child sizes so you have to go to the women's size. This is probably the reason for the size discrepancy. Keep in mind, if you are buying these for a child, an adult 3 is not a child 3. That being said, these shoes still run small and narrow. I got my daughter a 4.5W (which is supposed to be equivalent to be a Euro 35, and equivalent to the 3.5 child she normally wears), and it was quite narrow and very small. It is about a third to a half-inch longer than the size 1.5 child's jazz shoe I got for her sister in this brand, and quite a BIT smaller than the 2.5W child Capezio ballet slippers I recently ordered. I am sending these back for a size 6W and hope they work. Obviously size up to match the actual adult size rather than trying to buy your child their regular size, but then size up again, in our experience! Great quality shoe, but they do NOT have their sizing accurate. The first pair I bought were painfully small. They recommend buying your shoe size and that they'll "mold" to your foot. Forget that. Order at least a size larger. I had to have them stretched and they were still tight. I ordered another pair (one stays at my studio and one i carry with me) 1.5 sizes larger than my shoe size and those fit. Excellent product, horrible sizing guidelines. The Wide is like narrow... The websight & seller gives very little guidelines, and leaves you guessing based on vague information. The guidelines state order what you normally wear, when that is not true. What you normally wear is 1-2 sizes too small. Order 1 to 2 sizes larger than you need if you expect to wear these out of the box, while keeping in mind that you need to break them in also. Very disappointed & now have no shoes for my show coming up...must now order a second pair, hope they fit, and deal with the hassle of returning these.